Hill’s Prescription Diet Canine Metabolic helps your dog lose weight safely and comfortably. Sometimes it can be hard to notice that your dog’s gained a lot of weight just by looking at them. But you might be more likely to notice them having a lot less energy than they used to, panting more than usual or slowing down. Often the best way to deal with an overweight pet is to make sure they get a lot more exercise and eat less – no more sneaky under the table treats! It’s a good idea to get your dog checked out by a vet though, so you can find out if your furry friend has any health issues behind their weight gain. They can also see if the extra weight has caused any problems of its own. They might have some recommendations on how your dog can lose the weight. Once your pet’s slimmed down again, you can maintain their new healthy shape through plenty of energetic walks, playtime and the right balanced diet. available in both dry and wet formulas. Your dog’s body has evolved to hold onto all the fat it can! A relaxed lifetime of snoozes on your sofa and walkies means that all that fat storage isn’t as important anymore. 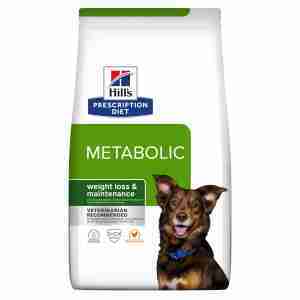 Hill’s Prescription Diet Canine Metabolic has been specially designed to encourage your pet’s body to burn fat instead of store it. This means you can feed them normal portions so they stay comfortable as they slim down, making their diet easier on both you and them. Veterinary diets like this one have been specially made to support pets with specific medical conditions. Because of this, they might not be suitable for all pets, so we'd recommend getting professional advice before feeding them to your pet. If you think your dog could benefit from eating Hill’s Prescription Diet Canine Metabolic, why not have a chat with your vet? Wheat, chicken (14%) and turkey meal, maize gluten meal, pea bran meal, maize, digest, tomato pomace, cellulose, flaxseed, dried beet pulp, coconut oil, animal fat, dried citrus pulp, dried grape pomace, spinach powder, minerals, L-lysine, L-carnitine, vitamins, taurine, trace elements and beta-carotene. With natural antioxidant (mixed tocopherols). Fat 11.3%, fibre (crude) 13.3%, moisture 8.5%, protein 26%. Vitamin A 9735 IU, vitamin C 122 mg, vitamin D 759 IU, vitamin E 675 mg, beta-carotene 2 mg, calcium 0.84%, carbohydrate 35%, L-Carnitine 290 mg, magnesium 0.12%, Omega 3 -fatty acids 0.72%, Omega 6-fatty acids 2.08%, phosphorus 0.62%, potassium 0.74%, sodium 0.33%, taurine 1062 mg. Fat 3.4%, fibre crude 4%, moisture 74.5%, protein 7.2%. Vitamin A 13860 IU, vitamin C 25 mg, vitamin D 93 IU, vitamin E 135 mg, beta-carotene 1 mg, calcium 0.2%, carbohydrate 9.5%, L-Carnitine 90 mg, L-lysine 0.44%, magnesium 0.02%, Omega 3 -fatty acids 0.23%, Omega 6-fatty acids 0.67%, phosphorus 0.15%, potassium 0.21%, sodium 0.1%, taurine 383 mg.
A 370g can is equal to 104 grams of the dry food. It's excellent and I can see a difference in our older dog after a few weeks. MedicAnimal delivered quickly and efficiently. My beautiful lab lost 1kg in her first week, keeping to recommened daily amount, encouraging, knowing that this food does work. I have been feeding my 10 year old Cairn Terrier a combination of the kibble and the canned for 4 months and she has lost over 2 kg. I carefully weigh out and use some of her daily allowance of kibble as treats. I also give her a couple of metabolic treats. If you have a problem working out how much to give your dog call Hills.